Endoscopic submucosal dissection (ESD) can remove endoscopically even for large early-stage tumors and tumors with severe ulcer scarring using an ESD knife, however, this procedure is technically challenging and has a risk of several adverse events such as delayed bleeding and immediately/delayed perforation. Once delayed perforation occurs, an urgent surgery is often needed. Therefore, careful management to prevent delayed perforation is needed to avoid an urgent surgery. In the present case, identification of the appropriate dissection layer was difficult due to severe whitish fibrosis into the submucosal layer resulting in the muscular layer being injured and the serosa was widely exposed. Although a simple closure using endoclips is standard procedure, the muscular layer defect was too large for that. Therefore, we applied a combination of endoloops and endoclips technique and then the defect was repaired by tightening the endoloop followed by clipping the space between muscular layer flap and surrounding mucosa. Postoperative course was uncomplicated. 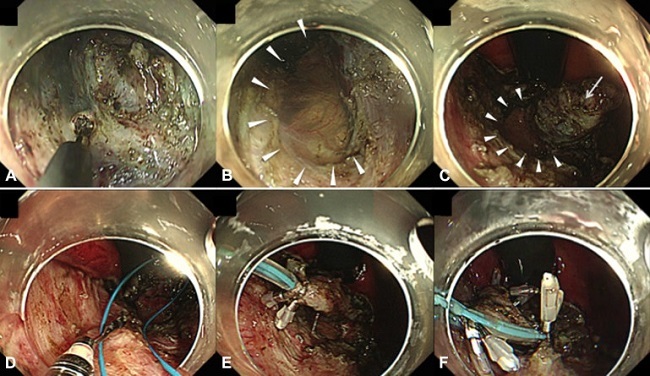 We demonstrate a case with a large muscle layer defect caused by gastric ESD, which is high risk for delayed perforation successfully repaired by a combination of endoloops and endoclips. Mastering of some closure techniques is required for completing a safe and success ESD procedure. Figure 1. A, Severe fibrosis was observed in the submucosal layer. A large muscle-layer defect was found. B, Arrowheads reveal the area of the muscle-layer defect. C, The arrow reveals a flap of muscle layer left after resection of the lesion. D-F, The muscle-layer defect was repaired by using the endoloop-clips technique. Find more VideoGIE cases online.